Home / Online money making / Tricks / How to Get 50% Discount on All Mobile Recharge ? Do you use Smartphone ? then you will also have a Sim Card, doesn't matter which company 's sim card you have. It could be Jio,Airtel,idea or Vodafone. So, you also Recharge your sim card on time to time. Recharging your mobile is becoming costly day by day.So,what if i tell you that ican save your 50% Money. Yes,you hear that right. you can Recharge your Mobile with 50% Discount and today i am going to tell you how you can recharge your mobile phone with 50% Discount ? 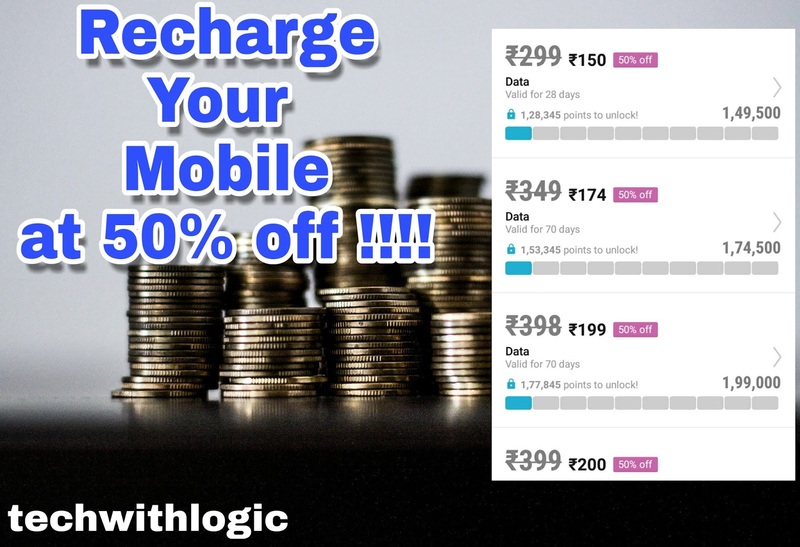 How to Get 50% Discount on All Mobile Recharge ? So,hello guys My Name is Lokesh from Tech With Logic and today i am going to tell you about Recharging your Mobile with 50% Discount and how you can do that? so,without wasting time let's start. Why You Need to Recharge with 50% Discount ? Guys almost all of you use Mobile data for Browsing on internet, so you need to recharge your sim card whenever your data pack expires, so people recharge thier sim card and data pack is becoming costly day by day there are some people who can't afford that Costly Recharges.So, this post is for them.Because after reading this post you will be able to Recharge your Mobile Sim card with 50% Discount.Yes that's really good guys Becuase just suppose if you are Recharging with 399 INR.then you are going to save upto 200 INR on Recharge. that 200INR you can use for your next Recharge and can Sleep peacefully.who don't like Saving Money ? yeah No One. This post is very Useful for you. that's what i am going to tell you today.so keep reading this. How to Recharge with 50% Discount ? Guys there is a app called Mcent Browser.if you use that browser it will allows you to Recharge with 50% Discount.Yes Guys in today 's world Nothing is free but this Browser just want you to use it. yes just use it as your personal Browser and use it as Much as you can. on your Next Recharge Period you will be able to Recharge with 50% Discount. Guys i want to tell you that you have to recharge your mobile first and use Mcent Browser as much as you can and after the time ending of your recharge pack you will be able to recharge with 50% discount. guys first of all i want to tell you that how Mcent Browser Works ? so, let's learn about it. Guys Mcent Browser is like a Normal Browser with some special features.it's Interface is Almost Similar to Google Chrome.It gives you coins for Browsing in Mcent Browser. No one Knows how the system works but you'll be able to get 10000 Coins a day by doing Normal surfing.Also in Mcent Browser you can Earn By Reffering System. If you Reffer a Friend and He/She uses it for 5 Days you will get 25000 coins. so, when you Need to Recharge your Recharge pack it takes coins to allow you Reccharge with 50% Discount. that's how Mcent Browser Works. so Now i Will tell you Step by Step How to Register on Mcent Browser? How to Register on Mcent Browser ? Guys first of all Download and install it by Clicking on Below Link. Mei Mcent browser use karta hu apni favorite sites chalane aur free recharge earn karne ke liye. Tum bhi try karo! Guys use this Link to Downlosd because downloading from this link you will get additional 25000 Coins. Now Move to Step 2. Now Guys Open this Browser and Register On it with your Sim you want to Recharge later. later you Can also add other Sim card Numbers also. Use Reffer Code " IHA2R5 "
By using Reffer Code you will Get 25000 coins. so, Don't Forget to use Reffer Code. Now your Browser Screen will open like below.here you can see at top you will See your Coins at right Side and on the left Side you will see your Reffering System. So guys just Browse internet on it and Make it as your Default browser so that you will use it more.Also Reffer to your Friends and on Each Successful Reffer you will Get 25000 coins. In coins Manager you see your Recharge availablity and at here you can add other sim-card also. So That's How you Can Get 50% Discount on Your Mobile Recharge.Hope you Like it.if you have any Problem then Don't Forget to ask in comments Section.I will Back with another Exciting Article for you.